Strange Culture: WTC Less Controversial than United 93? WTC Less Controversial than United 93? Earlier this summer Entertainment Weekly Did a story on the 25 most controversial movies. On the list United 93 shows up as number 16. It's controversy is not for the film's content in itself but for the reason that many wonder if it it's too soon for a film about 9/11. Don't you remember the outcry? I believe one of the first films a United 93 preview aired with was Inside Man, and the weekly's ran stories of people complaining and leaving the theater. It was a very touch subject back in April. Yet now as World Trade Center is being released the talk and discussion is different. Stone's film appears to be heavier and more emotional in nature from United 93, but some how United 93 has broke the ice and people's disgust in Hollywood's timing seems far more subdued. 30 Apr 2006: update: united 93, blak, survivor, jesus camp, ect. I saw United 93, and I will see World Trade Center. I spent nearly two entire days glued to the TV on Sept. 11 and 12 in 2001. While I wasn't in New York, and I wasn't related to anyone who died or knew anyone who died, it was painful. That being said, I have to agree with Oliver Stone. These movies need to be made. People need to remember. It's a shame that people are already forgetting. They won't let the footage in any form be shown on TV. These films serve as the only reminder of what happened to this country. do these movies really need to be made? 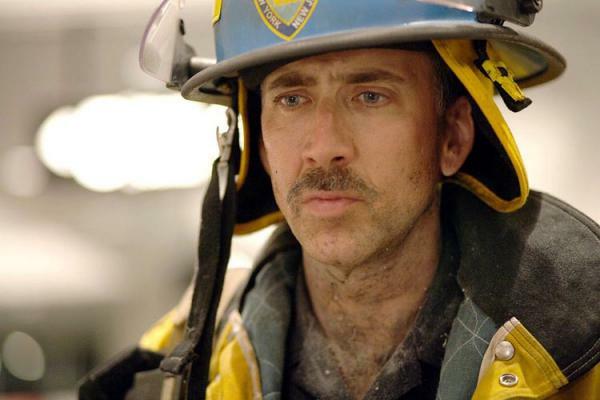 Does the fact that someone in Lincoln, Nebraska can spend 10$ to see Nicolas Cage dressed up like a firefighter really make people remember what happened that day? I suppose I can't understand. You see, as someone who lived 6 blocks from the WTC on the corner of Fulton and Gold Street for the summer of 2001, and as someone who into that building every day from 6/4/01 until 9/4/01, and as someone who lived on New Jersey Ave, SE in Washington DC on the day itself, 9/11/01, I really have no problem "remembering" what happened that day. Friends lost lives, and homes, and offices, and jobs. I sat, powerless, along with my neighbors a mix of young students, Hill staffmembers, and a few Congressmen even, watching as the House offices emptied of people and National Guard troops rolled along our streets. I too sat on the couch in my Washington DC apartment, while I could see smoke across the Potomoc from the Pentagon burning. I have no problem "remembering." So I suppose, I have a hard time seeing these movies like United 93, or WTC, as anything other than what they are....artistic interpretations trying to tell a story about the lives affected on that day. They're both intended to make money. 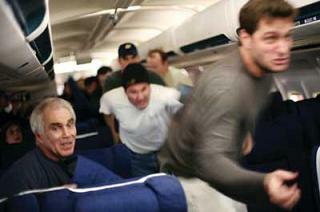 (after all, in America, that's why people make movies) I saw United 93, and it felt more like a documentary than a film. It was alright, but I knew what was coming, of course and that made me have a hard time enjoying it. WTC is Oliver Stone, using Nicolas Cage and others to put faces on the victims. I hope it is well done. I anticipate seeing it sometime soon. But should my fellow Americans really need to remember that day, I simply suggest you pick up a newspaper and read about the ongoing battles in Afghanistan, Iraq, now Lebanon...because this is all fallout from the day of 9/11. Do we really need another movie that will highlight how the poor USA has suffered? More people die more often around the world than in this "tragedy". I mean no disrespect to victims and their families etc. but good grief, NOTHING happens unless it happens in America! I haven't seen either of these movies but I 'm sure I eventually will. I don't have a problem with movies about 9/11 being made, but I understand that there would be people much more directly involved who would. for the record, let me say, I definitely do not have a problem with these movies being made. i simply wish the rest of the country wouldn't assume that everyone affected by 9/11 feels or acts just like the characters in the movie. and no, i'm not "scared" to live here....which is a question that my friends and relatives in Michigan, ohio and illinois, constantly ask me whenever the subject of 9/11 comes up. its a movie. that's all. a fictional depiction of the days events based upon the factual information available, and a screenwriter and director's creative minds. a movie. don't turn it into some sort of religious statement. and yeah, there are tons of other places in teh world....but Hollywood appeals to Americans and Americans like AMericans, not Africans (sad, but true). therefore, Hollywood makes movies about American tragedies. if you were a capitalist, you'd make movies about America too. Neither film offers an alternative look at the events of that day. I am waiting for that film. p.s. A post I did in April about "United 93" has been visited numerous times by gov't spooks. Weird. katieg, you lived it - up close and personal. Folks like you won't forget (not that anyone should), at least not as easily as others may. spoke, they've made a movie about Rwanda...and it was quite good, actually. awg, if Oliver Stone can't see a possible conspiracy theory in something, I don't see how anyone can. Most of those folks have had their theories bashed by the transcripts and testimony released recently showing the screw-ups by the FAA, American Airlines and NORAD. I'll never forget 9/11. I still cringe any time I see the planes flying into those bldgs.. I can't imagine what it must have been like to be there in NY on that day and the days following. Not sure when the movie will come out here in Bahrain... prob not for a while. I didn't see United 93, altho I want to. I'd rather rent it and watch it in the privacy of my own home though. awg, there is a movie that offers an alternative look. It is called "Loose Change 2". I'm not sure where you'd find it, but it offers some very different ideas about what happened that horrible day. It is called "Loose Change 2". I'm not sure where you'd find it, but it offers some very different ideas about what happened that horrible day. I refuse to see this movie. Even if I wasn't offended at its existence, it looks like a terrible movie anyway.